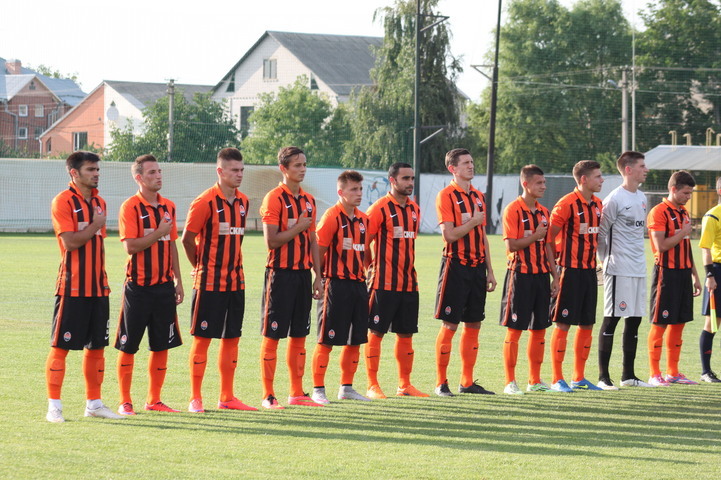 On matchday 5 of the U21 league, Shakhtar’s youth side beat their peers from Dnipro. In the 59th minute, Boryachuk missed a penalty (wide). Today’s game saw the match-up of league leaders: Shakhtar U21 were going unbeaten with Dnipro sitting in second place, three points behind the Donetsk team. The Pitmen’s starting line-up saw the appearance of first-team players: Ismaily, Serhiy Kryvtsov, as well as Mykola Matvienko and Serhiy Gryn, who played in all previous games of the U21 league. The scoring in this match was opened on 24 seconds: Andriy Boryachuk received a pass in the penalty area from Mykhailo Shyshka, beat the defender to plant the ball into the far corner of the net to make it 1-0. For Boryachuk, it was the fifth goal in the season, he topped the top scoring race; he scored in the fourth match in a row. As the game progressed, the Pitmen took control of initiative, forcing the visitors to defend. Shakhtar were very good at making long and defence-splitting passes, but there were not final shots. Dnipro managed to streamline the counter game only in the 30th minute, having troubled the Pitmen’s goalkeeper on a couple of occasions. The tempo of the game continued to slow down – the players’ actions suffered from extremely hot weather. The first half ended 1-0. After the break Dnipro started playing more energetically, wasting a good chance. The Pitmen responded on 54 minutes, when Serhiy Gryn lobbed the opposition goalkeeper, who had rushed out of goal. On 59 minutes, Gryn darted into the opposition penalty area, only to be brought down by the Dnipro goalkeeper. Not only did the referee award the penalty kick but also showed the red card to Kirychuk. However, Boryachuk failed to convert a spot kick, sending the ball low and wide of the goal post. But already after a minute Gryn made a run into the Dnipro penalty area, skipped past the defender to send the ball into the net to make it 2-0. The Pitmen’s forward scored his fourth goal in the youth championship. Shakhtar continued attacking. Boryachuk wasted two good chances, Gryn’s long shot was kept out by the opposition goalkeeper. Vladislav Bugay, who came on as a sub, had a chance to score but he missed the target. At the same time the visitors failed to threaten Gritsenko’s goal. Therefore, Shakhtar got their fifth win since the start of league campaign, and Miguel Cardoso’s team cemented their lead in the standings, claiming 15 points. The Pitmen’s gap on the nearest rivals will be known when Oleksandriya and Zorya play their league games. In the next round, the Pitmen will play a home game versus Metalurh Zaporizhzhya in Schaslyve. - Of course, it was a very important match! We were preparing for the game with the utmost determination, with serious ambitions, because we wanted to finish this part of the championship on a positive note. Now we will take a rest for a few days before resuming our work. The game with Dnipro took place according to our plan: we knew that the opponents would deploy defensive tactics, waiting for their chance to orchestrate a quick counterattack. Even after conceding a goal, they did not change the direction of their actions. Dnipro do not concede a lot of goals; they are a skilled team. Our guys, in fact, had an incredible game – they played competently in terms of tactics, even in difficult weather conditions. Good ball control allowed to deliver it into the free zones, the players were taking their time. It is necessary to congratulate the team, who have done an excellent job! In addition, we give an opportunity for younger players to prove themselves. Five wins won’t make the boys complacent – I will not allow that. We are also working on the psychological aspects. Victories are also a kind of habit, but we must always keep our feet on the ground.